Voeg nog 10,01 TL aan artikelen toe aan je winkelwagentje om je korting te ontvangen. Niet in Turkije? Kies de winkel van het land waar je je in bevindt om verkrijgbare boeken te zien. Book Three in the harrowing and heartwarming Supper Club Mystery series by New York Times bestselling author Ellery Adams! Former professor James Henry is back in the classroom, as a student this time, and he’s dead set on counting calories and catching killers . 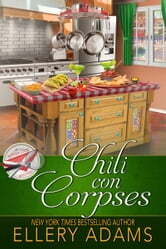 . .
Dreading another week of dieting, librarian James Henry and his supper club friends decide to spice things up by taking a Mexican cooking class. The mood is festive and the meals are almost good enough to make James forget about cheese doodles. But when another member of the class is found dead, what started as a quest to make the perfect quesadilla turns into a sizzling murder investigation. Determined to track down the culprit, the Flab Five are stunned to learn that one of their own is being grilled as the main suspect. With time running out and Quincy’s Gap boiling over with fear, James and the supper club will have to concoct a plan to trap an elusive criminal with an appetite for murder. This is a brand-new, fully revised edition of a book originally published under the name J. B. Stanley. New York Times bestselling author Ellery Adams grew up on a beach near the Long Island Sound. Having spent her adult life in a series of landlocked towns, she cherishes her memories of open water, violent storms, and the smell of the sea. Her series include the Supper Club Mysteries, the Antiques & Collectibles Mysteries, and the Book Retreat Mysteries, among others.